Beef shank requires cooking slowly at low temperatures to tenderize the meat and dissolve the tough connective fibers. Although beef shank is a lean, flavorful and inexpensive roast, it tends to be one of the toughest cuts of meat because it comes from the muscular, constantly exercised front leg of the animal. However, patience pays off, creating a tender, mouthwatering roast. 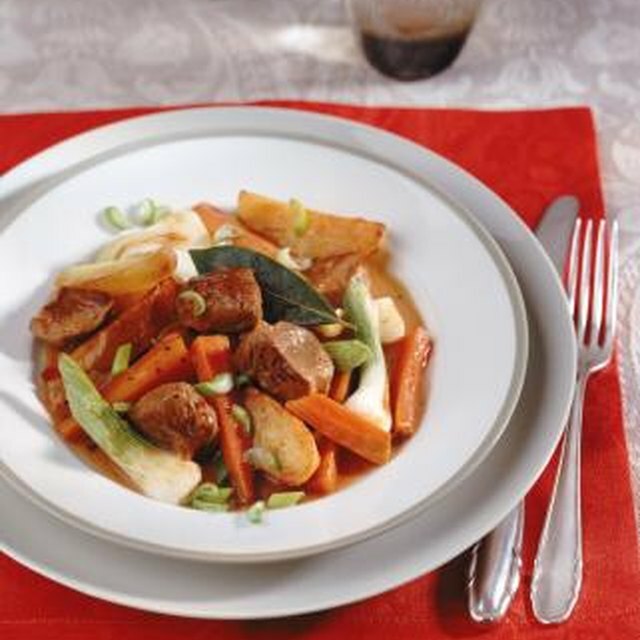 Simmer the meat in a combination of wine and broth to intensify flavor and depth. Dry the beef shank with a paper towel, then season all sides of the meat with salt and pepper. Drizzle a small amount of cooking oil or bacon drippings in a Dutch oven. Heat the oil over medium heat, then sear the roast for about 7 minutes per side, or until the meat is evenly brown. Transfer the shank to a plate. Add aromatics like garlic cloves, chopped onion, leeks or shallots to the hot oil and cook until the vegetables are tender. You can also chop a few strips of bacon, then fry the bacon with the vegetables to provide extra flavor. Turn the burner up to medium-high. Return the shank to the pan, then pour in enough beef or chicken broth to cover the meat. If desired, add root vegetables such as potatoes, sweet potatoes, turnips, carrots or parsnips. Cover the pan securely and transfer the pan to an oven preheated to 250 degrees Fahrenheit. Cook the shank for 4 to 5 hours, or until the meat easily falls off the bone when pulled with a fork. Remove the shank from the pan. Allow it to rest for at least 3 minutes. Season the meat with salt and pepper to taste, then cut and serve. Rinse the shank, then pat it dry with paper towels. Cover the bottom of a heavy skillet in cooking oil or bacon drippings. Heat the oil, then brown the shank evenly on all sides. Transfer the shank to a slow cooker. Cover the meat with liquid such as water, chicken broth or beef broth. Saute aromatics such as garlic, chopped onion, leeks or shallots to the hot oil in the skillet, then cook until they are soft. You can also saute a small amount of chopped bacon with the aromatics, if desired. Cook the shank until the meat is fall-apart tender, approximately 8 to 10 hours on low or 5 to 6 hours on high. Remove the shank from the slow cooker. Season the shank with salt and pepper as desired, then serve it hot. Add liquids such as wine, beer, orange juice or apple cider to the cooking liquid to provide additional flavor, if desired. If you don't have a Dutch oven, brown the shank in a heavy skillet, then transfer the meat to a covered roasting pan to finish cooking in the oven. Always be sure meat is cooked to a safe, minimum temperature of 135 F, then let the meat stand for at least 3 minutes before serving.